CFLs are no doubt among most popular light types used in the past 20 years. Enter any household and you can find at least one set of CFL. However, these fluorescent lamps are also heavily used and favored by many gardeners for growing plants indoor as well. CFLs are equipped with many incredible benefits no other grow light types can beat like ease-of-use, high availability, little heat, and low-cost. In this post, I will go further about how to use CFL grow lights for the best results and also help you choose the best CFLs for your growing setup. In a hurry, here is my recommendation for CFL grow lights. Light quantity and quality of your bulbs can bring or break your garden's productivity. Most of the CFLs sold on the market only have the Lumen, wattage, and Kelvins as the descriptions of their bulbs. But to measure the effect of these units onto your plant growth, they are not a very good measuring unit. A proven measuring one would be by PPFD, and DIL. It tells you how many photons of light within the visible light between 400nm-700nm hit a square meter per second. PAR, or Photosynthetic Active Radiation is the range of light, from 400nm (Blue) to 700nm (Red), which plants use to grow. However, as there are not many CFL types sold and they also do not have as many PPFDs (and DILs) as LEDs and HPs, this figure is not so important when choosing CFLs. First, even if the manufacturers list the PAR and DIL meter, it still doesn't tell you much. Unless you are growing in a very small place and placed in an exact position like the manufacturers, the PPFD will not give much accurate information. It is better to tell the complete environment that manufacturers use to measure the PPFD, but is it worth the necessity for them to do that? Second, a PPFD only tells how many photons can approach plants, and it treats all wavelengths the same even though specific wavelengths are stronger than others. And many studies have shown that light quality does affect plant growth. That also means, even though light quantity is always more important than color types, the two light types have the same PPFD, and DLI will give different results for plant growth at different wavelengths. With that said, DLIs should be given to other types like LEDs because people can custom the specific wavelengths. Meanwhile, with CFLs, you can not. CFLs only have a particular wavelength of the spectrum. Compared with other types of lights like LEDs, CFLs do not have as good PPFDs or DLIs as them. And, in fact, most of the CFLs on the market do not have high DLIs. In this case, we can use the relative measuring units. That is lumens, and wattages, and Kelvins. Third, most of the time, you choose CFLs because of many benefits like low cost, less heat, convenience for small-setup, and portability. And definitely, just keep in mind that CFLs will work for every setup, and measuring units like PAR are not as efficient as in LEDs. So don't care much about it. This list below shows our favorite CFL grow lights. For many growers, especially starters, it's easier to buy already set up CFLs bulbs with the fixture. This is to save you so much time and to forgo the headaches and hassle when setting the full CFLs system for growing. There are lots of CFLs brands on the market, but there are few already setup products and I will only list the brands that are well known, have been tested and proven by indoor growers. After 25 hours of researching and talking with some indoor Hydroponic growers, I find that the Hydrofarm Agrobrite FLCDG125D Fluorowing Compact Fluorescent System is cost-effective, low-maintenance, and super easy-to-use for any growers. It already has the set-up fixture that is easy to be hung and work immediately. 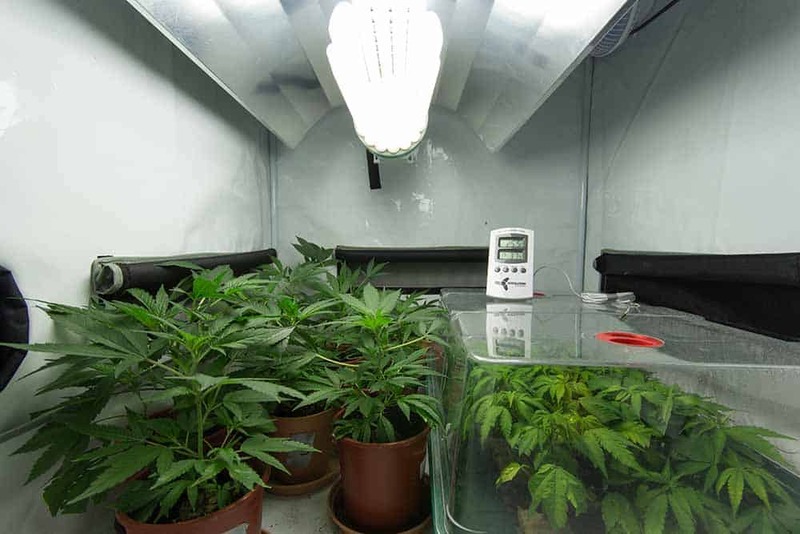 Since the product comes with 125 wattages with the lumens measured at approximately 7000, you can grow up to 3 plants within 3"x3" feet set up. But I recommend you to grow maximum 2 plants in 2"x2" for the best yields. Size and weight 18 x 10 x 4 inches, 3lbs. Tubular form. Equal light output unlike the spiral bulb, where light emits more to the sides. Can change spectrum by switching bulbs. Can only fix Mogul socket. Can only accommodate up to 200 watts. Doesn't work best for flowering phase, or buds, fruits. Better supplement with some flowering bulbs. The Hydrofarm, just like any other CFLs types which are designed to work with one growing phase, has the daylight white light. This is best suited for the vegetative period, and leaf vegs like lettuce, spinach, etc. It's totally fine to use this throughout the growing period. But if you want optimal results or if you want to grow buds and fruits, you should add some warm, red spectrum lights. Just replace the 6400k bulb on the socket with it. In case you want to set up yourself, there are lots of CFL bulbs on the market to choose. I'll recommend you to get some daylight bulbs together with some warm bulbs added to give enough light spectrums for your grow setup. Here are our top choices. Commonly, these bulbs give daylight color with not less than 5500K. Again we find the Hydrofarm Agrobrite 32 Watt, 6400K works great for individual light setup. The brand is designed for indoor grow lights, nowhere you could go wrong with it. The product has the spiral form just like any standard CFL bulb. Bulb details include 32 Watt, 6400K, 1800 lumens. They all fit normal light fixture with standard base. Another great brand is the SunBlaster CFL Self ballasted Propagation lamp, 6400K Light Spectrum. This spiral bulb also fits normal fixtures with a standard base but comes a little lower in wattages at 26 watts. The product gives 17000 lumens. For small wattage bulbs, be sure to get at least 3-5 bulbs for an efficient grow light environment. For growers who don't want to install lots of bulbs around your plants, there are some grow bulbs with larger power. Product details: tubular, 125W, 6400k, 7000 lumens, fit mogul socket. It is the same brand with the same bulbs with our top pick above. What is different is that it doesn't come with the reflective hood and fixture. Best CFL bulbs for flowering growth. These kinds of bulbs give the spectrum in warm white color with no more than 3000K. The Satco Lumens is a great option if you want to set up some individual low power bulbs for blooming phase. Product details: spiral, 2600lumens, 40W, Medium base, 10000h lifespan. Get the Apollo Horticulture 125 Watt CFL Bulb of 2100K. It is enough for 1-3 plant set up. And like the Hydrofarm 125W 6400K, you will need a Mogul base socket to get it work. When the classic incandescent lamps invented by Thomas Edison are no longer efficient in modern days, the CFLs are created to replace them. The compact fluorescent lamps win over the incandescent bulbs with a longer lifespan, significantly less heat emitted, and more light outputs with the same watts. Most of the time, for starters and hobbyists, who don't want to spend much cost on growing initially, CFLs are great. They are the big bang for the buck. They're also easy on your power bill. The days when you electricity bills are a burden for growing plants indoor are long gone. While HPs/MH heat emission seems like a big issue. The LEDs are out of your budget. Meanwhile, the T5 lights are not great for your spaces and are not portable like the CFLs. This makes CFLs the perfect choice. Or it's just simply because they are easy to get or as simple as because they are your preference. CFLs can be used alone for the whole growing phase for all kinds of plants. They can be used in combinations with other light types as well. Normally last up to 10,000 hours, half as long as the fluorescent tubes. Versatile. Mobility. Ease of use. Small, short. Can be plugged into a conventional light socket. Self-ballasted. Don't require ballasts like the fluorescent tubes (T5, T8). Less mercury than fluorescent types, but still contain mercury. Expendable (you can extend the lights wattage as long as the fixture withstand more current), which is untrue for LEDs. Not as efficient as HIDs (HPs) or LEDs. Not effective when growing many plants, or for large setup. Shorter lifespan than HIDs, LEDs. Still heat up if lots of watts are used. Most of the CFLs sold are not full spectrum. Mostly they are in two color types: warm and daylight colors. And instead of indicating the color of bulbs when lighted, people use Kelvin to measure the light color (or also light temperature). Kelvin is abbreviated as (K). And the lower the number, the redder/warmer the light. Below are the two types of CFLs you'll see on the market. - 2000K/2700K, warm color, gives color in yellowish, red spectrum. Best for flowering, and blooming. There is also a dual spectrum type, in which the manufacturers have customed to produce some yellow lights mixed with some blue ones. Any experienced indoor growers know that you cannot get a one-color bulb type and uses it for the whole growing phase even though you can still use it and enjoy some fair results. And regarding the CFLs, because the way they are created, there are no specific CFLs that can fit all kinds of plants and their growing period. For the best results, you should use mixed lightning. In other words, dual Spectrums. Keep this in mind not to get unsatisfactory returns like shorter plants, smaller sizes, buds. Say you can use the red light for whole growing phase, and your bud, flowering stage loves that, but you should know that the bud and the plant will not grow adequately without a strong root system, vigorous leaves, and stems to move moister and nutrients throughout the plants. That's why you need both lights at the same time with an unequal ratio. Or if you cannot use duel spectrums for your setup, you can stick with the rule that the blue daylight bulb for vegetative growth, and switch to warm yellow bulb when plants reach their flowering phase. One big CFL or multiple small CFL bulbs? So you have two different options to go. To use a big small CFL bulbs or to buy separate and build your own. Of course, if you go the DIY way, and if you separate bulbs and set up them yourself, the cost will be lower. You can put the bulbs all around the plants, which will be definitely better than using one big bulb, which only gives light from one side. But like all things, it will trade with your time. How far should you place your lights? As said, you can place the CFL bulb as near your plants as possible. The recommended distance is 2" - 4". Unlike some hot types like the HPs and other high-intensity light like LEDs, you can place the CFL bulbs near your plants without afraid of burning them. Check and adjust CFLs often. When your plants grow, the distance between the CFLs also reduces. So better to keep the stated distance above. What color types do I need for my set up? You should know that plants need warm and cool color spectrum for its whole life. More cool lighting (6500K) for the flowering stage. If sticking to the more bluish spectrum will reduce the size of your buds, bud quality and the plant yield. Turn to bluish light for the last week or two of the budding. The last week before harvesting is dedicated to ripening, not for bud growing anymore. How much light wattage/lumen I need to have if my set up is small. Say, about 2-3 plants? It's better to give the answer in terms of space (square feets) than how many plants. The general guideline is to give 80W - 100W per square foot the growing area. Most vegetable crops only need 50 - 70 watts each square foot. But others light craving plants like cucumber, tomatoes, peppers, cannabis need higher watts, lumens, PPFD, DIL. So the answer is that for 2-3 plants, and each plant contains 1 square foot, you should need not less than 150 wattages. In terms of lumens, it's always great if you can have as much as possible as long as your space can handle the heats, up to around 10000 Lux. That is the case of CFLs. This is not true with other light types as CFLs do not give much heats and PPFD. And even though too much light can bring along the photoinhibition like in some vegs that don't need much light but as CFLs do not provide as much as light intensity like LEDs. You don't take much consideration of it. Just give as much as lights as you can as long as your plants are not burned. Another important key to keep in mind is that the quantity of light is always better than light quality, or the specific light spectrums you give the plants. In all cases, the plants will still grow at a good rate if being provided with enough light quantity despite using just one wavelength. But if you give them the correct ratio of multiple spectrums (light colors) but fail to provide them with enough light intensity, they will not able to photosynthesize and will not grow well. Growing with CFLs is great, especially with its convenience, low investment cost while still enjoy excellent results. 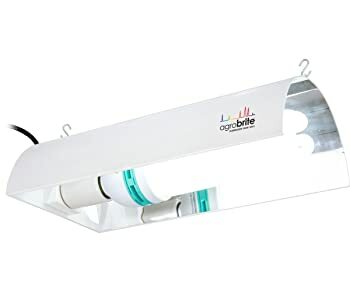 For recommendation, the Hydrofarm Agrobrite FLCDG125D Fluorowing Compact Fluorescent System with CFL Bulb will get you fast enjoyable results for your vegetables, herbs, seedlings, fruits and any plant types. If you crave for better results with the fruits, buds, get the extra bulbs with 2100/2700K that fit well with the sockets. If you want to do it yourself or just want to only buy CFL bulbs, you can get separate bulbs. We have recommended our top picks for the vegetative and flowering growth. Whatever choices you make, I believe you will come out with excellent plants growing with CFLs. GreenandVibrant.com is a participant in the Amazon Services LLC Associates Program, an affiliate advertising program designed to provide a means for sites to earn advertising fees by advertising and linking to Amazon.com.